The company was founded on July 10, 1935 as Bell Aircraft Corporation by Lawrence Dale Bell in Buffalo, New York. The company focused on the designing and building of fighter aircraft. Their first fighters were the XFM-1 Airacuda, a twin-engine fighter for attacking bombers, and the P-39 Airacobra. The P-59 Airacomet, the first American jet fighter, the P-63 Kingcobra, the successor to the P-39, and the Bell X-1 were also Bell products. In 1941, Bell hired Arthur M. Young, a talented inventor, to provide expertise for helicopter research and development. It was the foundation for what Bell hoped would be a broader economic base for his company that was not dependent on government contracts. The Bell 30 was their first full-size helicopter (first flight December 29, 1942) and the Bell 47 became the first helicopter in the world rated by a civil aviation authority, becoming a civilian and military success. Textron purchased Bell Aerospace in 1960. 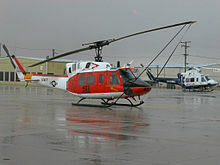 Bell Aerospace was composed of three divisions of Bell Aircraft Corporation, including its helicopter division, which had become its only division still producing complete aircraft. The helicopter division was renamed Bell Helicopter Company and in a few years, with the success of the UH-1 Huey during the Vietnam War, it had established itself as the largest division of Textron. In January 1976, Textron changed the name of the company again to Bell Helicopter Textron. Bell Helicopter has a close association with AgustaWestland. 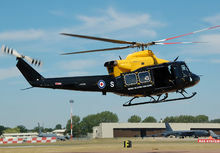 The partnership dates back to separate manufacturing and technology agreements with Agusta (Bell 47 and Bell 206) and as a sublicence via Agusta with Westland (Bell 47). When the two European firms merged, the partnerships were retained, with the exception of the AB139, which is now known as the AW139. As of 2014[update], Bell and AW cooperate on the AW609 tiltrotor. 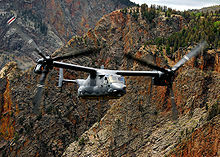 Bell planned to reduce employment by 760 in 2014 as fewer V-22s were made. A rapid prototyping center called XworX assists Bell's other divisions in reducing development time. The company was rebranded as "Bell" on February 22, 2018. Established in 1986, its Mirabel, Quebec facility assembles and delivers most Bell's commercial helicopters and delivered its 5,000th helicopter on 12 December 2017. ^ "Our History". Bell Training Academy. Archived from the original on September 27, 2007. ^ "Westland History – Part 4". ^ a b Oliver Johnson & Elan Head. "Bell CEO outlines European growth plan" Vertical, October 15, 2014. Accessed: October 21 ,2014. ^ "Bell's XworX studying improved rotor blades". Aviation International News. ^ "Bell Drops 'Helicopter,' Unveils New Dragonfly Logo". ^ Goldstein, Michael. "Bell Nexus VTOL Air Taxi Makes A Splash At 2019 Consumer Electronics Show". Forbes. Retrieved 2019-02-02. ^ Mark Huber (December 13, 2017). 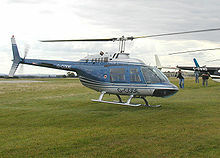 "Bell Canada Delivers 5,000th Civil Helicopter". AIN. Wikimedia Commons has media related to Bell Helicopter. "Patents owned by Bell Helicopter Textron". US Patent and Trademark Office. Retrieved December 5, 2005.